Use once or twice a day in the AM and/or PM. cleanse skin and allow time to dry. Smooth product over face and neck allowing product to absorb completely. You may experience a slight tingling or tightness during use. This is normal and is a sign that the product is working. Discontinue use if skin irritation develops and lasts. Follow with a gentle moisturizer or makeup if desired. If applying an additional moisturizer, use one free of Retinol or Alpha Hydroxy Acid. Apply a sunscreen of SPF 15 or higher during the day while using this product. Continue using sunscreen for one week after stopping use. 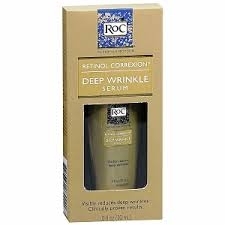 If using an additional moisturizer, consider RoC® Age Diminishing Daily Moisturizer or Age Diminishing Night Cream to compliment your daily routine. Both are free of retinol and clinically proven to diminish the appearance of wrinkles, leaving skin soft, smooth, and younger-looking.